Wild Nutrition’s Caprylic Acid Plus is a unique blend of herbs, botanicals and whole-food nutrients for healthy gut function. Assists the shifts in bacteria or flora as well as supporting natural tolerance and repairing of the gut wall. The Caprylic Acid Plus contains eleven beneficial active substances known to help reduce and inhibit the growth of detrimental bacteria and other detrimental micro-organisms within the digestive system, helping to improve its function, and reduce infections. 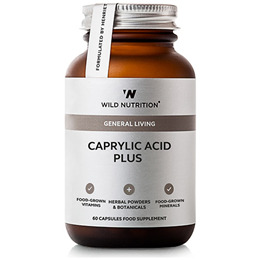 Caprylic Acid is established as one of the most helpful natural treatments for the overgrowth of candida albicans whilst also having anti-viral and anti-bacterial properties too. For all the family, this unique complex can be used if your diet was once high in sugar or yeast or as part of a cleanse. Calcium caprylate (providing: Caprylic acid), Vegetable cellulose (Capsule shell), Slippery Elm bark powder, Garlic powder, Aloe Vera powder, Pau D`Arco powder, L-Glutamine, Cinnamon powder, Grapefruit seed powder, Lemon Grass powder, Peppermint leaf powder, Nutrient enhanced yeast (providing: CoEnzyme Q10). Do not take if paper tab on lid is broken or missing. Below are reviews of Wild Nutrition Caprylic Acid Plus - 60 Capsules by bodykind customers. If you have tried this product we'd love to hear what you think so please leave a review. Very helpful in re-balancing after a Candida attack.